If you are a lover of jazz music and own an iOS device there is an application available that can deliver to your iPhone, iPod Touch or Apple iPad, a selection of hundreds of title from the best jazz albums around, that iOS app is called JazzAlbum. JazzAlbum for iOS devices enables the user to begin their search from musical instruments, and will quickly deliver information about the instrument and the artist that plays said instrument along with any of their albums. 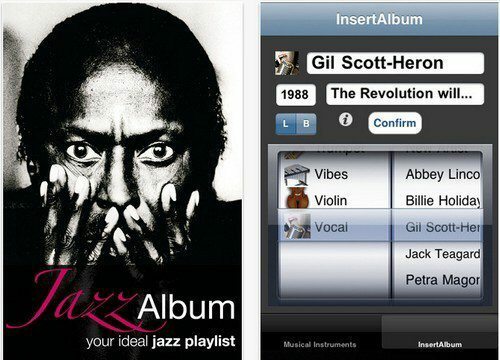 With the JazzAlbum app for the iPhone, iPod Touch and Apple iPad, the user receives such information as the title, the year of recording, and any other musician that is performing in the playing album, and if the album shows in your iPod library you can listen to it and if not you will be directed to hit up iTunes to purchase the album. The JazzAlbum app for iOS devices is available to download for devices running iOS 4 and above at a cost of $0.99 from iTunes.